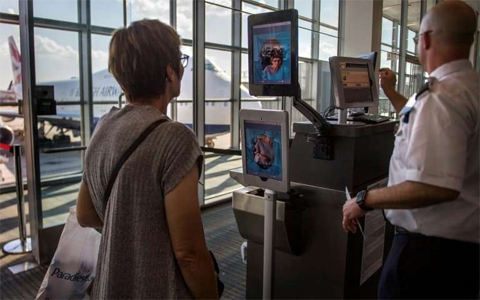 DULLES: As facial recognition technology use generates intense scrutiny, a new system unveiled at Washington’s Dulles airport is being touted as a “user friendly” way to help ease congestion for air travelers. Officials at Dulles unveiled two new face recognition systems Thursday, one to meet legal requirements for biometric entry-exit records, and a second to help speed processing of travelers arriving on international flights by matching their real-time images with stored photos. The system is designed to boost security by ensuring that travelers are using their real passports and not forged documents, matching to existing photos from passports or images collected from foreign nationals when they enter. The Dulles system began operations in mid-August, ahead of the media event, and within three days was credited with the arrest of a man attempting to use a fake passport to enter the United States. “We are not collecting or retaining any new data,” McAleenan said. “We need to confirm that the party travelers are who they say they are.” Dulles is one of 14 “early adopter airports” using facial recognition technology for the entry process. McAleenan said that because the new system uses only its own images and passport photos, its accuracy rate is “99 percent.” “We are not seeing significant difference across gender or race,” he added. The CPB system was developed within the agency, part of the Department of Homeland Security, with unspecified technology partners, according to McAleenan.